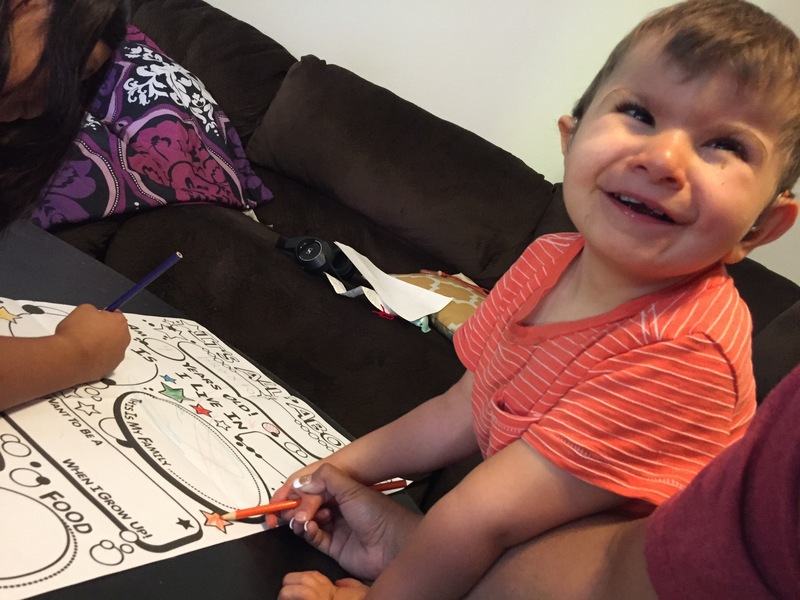 There was a lot of hand-over-hand help, but Braxton enjoyed coloring his project. 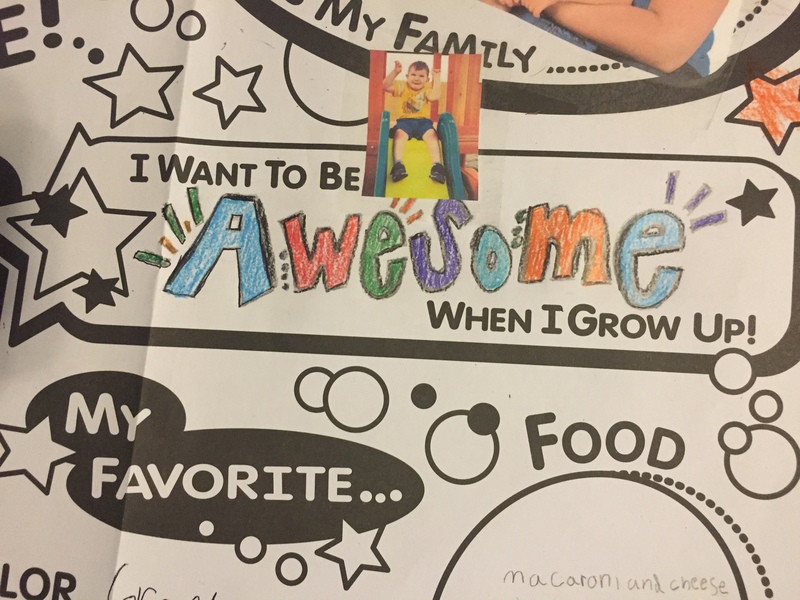 Braxton came home with an assignment this week- to fill out an “All About Me” Poster. I looked at it and thought how fun it would be to work with Braxton helping him color it in and gluing pictures to show his classmates. All the standard questions were there, My name is ___, I am __ years old, I live in ___, and then there is a space for Braxton’s picture, and finally I get to “I want to be a ___ when I grow up.” I mentally filled in the blanks for all of the other questions as I looked it over, but when I got to that last one I paused. I don’t know what he wants to be when he grows up. Questions like that make me sad for a number of reasons. For one, I don’t even know what I would “make-up” as a realistic answer because I don’t know what he will be capable of in the future. Sure, parents tell their kids that they can be anything that want to be and we don’t ever want to crush their dreams, but as a parent of a child with special needs I feel a greater responsibility to make sure those dreams are realistic. I want to always set my son up for success and one of the ways I can do that is by giving him attainable goals. Even if they are out-of-reach they should still be attainable, meaning that if he really worked hard and everything fell in to place, it could be possible. Picking something out of the sky hardly seems fair. Secondly, I think what hurts most is when I realize that he lacks the ability to answer for himself when it comes to likes/dislikes, preferences, goals, dreams, etc. Even if what he wanted to be when he grows up is unattainable, he can’t even tell me what that dream might be. I don’t know if he wants to be fireman, a teacher, a doctor, the president of the United States, or any other profession. And I feel completely guilty when I have to pretend that I know what he would say. There is a big difference in speaking up for him and speaking for him. I will always speak up for Braxton because I am his parent and advocate. I will be his voice to make sure his needs are met and to be certain that he is treated with kindness and equality. Speaking for Braxton diminishes him as an individual and inhibits his ability to think for himself. Just because he cannot tell me what he wants to be does not mean that he does not have a dream for his future. Speaking for him could eventually send him the message that what he has to say is unimportant and not only will he stop thinking for himself, but he will then lack all motivation to speak for himself. I don’t ever want Braxton to feel that way, which is why speaking for him, even in what seems like meaningless situations (like a class assignment), brings on so many mixed emotions. Braxton has made incredible progress with his Augmentative Communication Device, but he is still not able to fully express himself like I would like to see. I know that he will get there eventually and I’m so glad that we have given him the tools he needs to be independent in his thoughts and expressions. But, until he gets there I struggle with how to handle speaking for him when it is called for and how it may or may not impede his ability to speak to us later on. So, how did I end up answering the question? While I have no clue what Braxton would like to be when he grows up, I think we can all agree that whatever it is he decides to be, he will be totally and completely AWESOME!